If you’re feeling like a turkey with it’s head cut off, considering Thanksgiving and the rest of the winter holidays are right around the corner (get ready for Aunt Sue to ask you if you’re expecting again, and for little nephew Timmy to throw his usual tantrum over sweet potatoes), you’re not alone. There are turkeys “chillin’” at the grocery store and well, not to be grotesque or anything but, they no longer have their heads either. That being said, before you continue to run around, “banging into walls” trying to get everything done, why not take a minute to chow down on the recipe shared below. I have a feeling it will help ease your anxiety and stress that hinders your sanity this time of year. Actually, nutritional studies has concluded that the ingredients included in this recipe WILL in fact calm you down, so feel free to eat two or three! 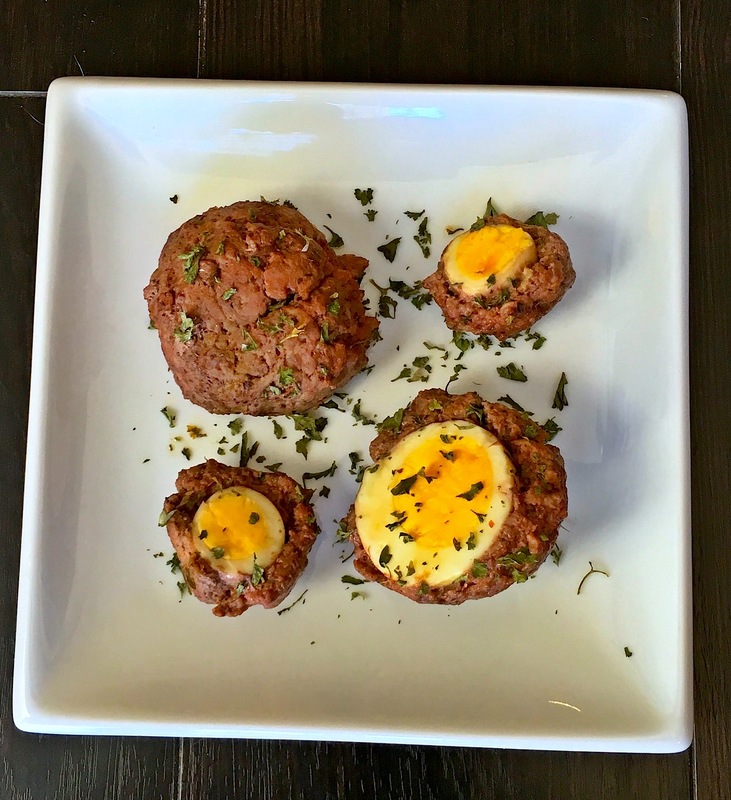 The recipe, Scotch Eggs (not exactly the traditional holiday fare here in the US), is comprised of ground meat (in this recipe, I used grass-fed/finished ground beef), eggs and lots of antioxidant-rich herbs and spices! Beef is high in zinc, iron, and vitamin B6, which are commonly deficient in those suffering from anxiety and the amino acids lurking within beef serve as building blocks for neurotransmitters in your brain that positively affect your mood! Making sure the beef you use in this recipe is grass-fed and grass-finished is extremely important though, for it’s far higher in healthy fats, such as omega-3 fatty acids and CLA, lower in saturated fat and lower in over all calories than conventionally raised beef. As for eggs, they too are full of all the essential amino acids, so they help boost your mood and reduce your stress levels as well. Also, if you purchase omega-3 enriched eggs, you will be doing yourself a service because these fatty acids help reduce tension levels as well! The bonus ingredient in this recipe, coconut oil, is a miracle worker when it comes to reducing stress and anxiety, thanks in part to it containing lauric acid, capric acid and caprylic acid, all healthy fats, essential in your diet! And hey, if you have any left over coconut oil, using it as massage oil (we all know massages help relieve stress as well), is a pretty great idea too! Hint, hint! Hard boil chicken eggs for 11 minutes. Hard boil quail eggs (if using) for 5 minutes. As eggs cook, combine all herbs and spices with ground meat in a bowl and mix together. Let eggs cool after boiling (in the fridge or in an ice bath) and peel. 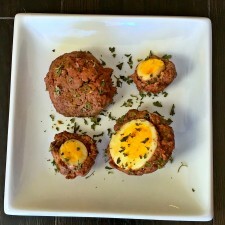 Wrap ground meat around egg, making sure to cover the entire egg. Place on a lined baking tray, rub with coconut oil and bake in the oven for 15 minutes. Take out of the oven, let cool and then enjoy the anxiety smashing properties that come with this chow! With all that being said, it’s quite obvious what you have to do now. Make this recipe, as a snack for when you’re on the go or as an appetizer prior to your holiday feast, and in no time, you’ll be able to retrieve your head you thought you lost the second you smelled the scent of pumpkin spice waft into the air! If you’re in need of a dyer energy boost between all the cooking and Black Friday shopping, be sure to whip up my Pumpkin Spice Latte! I didn’t know what grass finished beef was until I googled it just now. Good info and a great recipe. Saw it on GiGi’s blog and wanted to get the details. Thanks so much! Glad that you liked the recipe! Thanks for visiting!